A Fighting Irish gone stronger. The Irishman line of Whiskeys comes from the upstarts at Walsh Whiskey Co. who set out to rediscover Irish-style Whiskey as it was made 200 years ago. When Walsh Whiskey first started, they contracted their distilling to Bushmills. But their success has allowed them to build out their own distillery in Carlow — in the heart of Ireland’s southern farm country — where they make four versions of The Irishman, three Writer’s Tears (among the all time favourites of the Flaviar community), and two varieties of Irish Cream Liqueur. The first thing you need to know is that The Irishman Cask Strength is limited each year to about 2000 bottles — that’s just five or six hand-selected casks of their best stuff. And like all great art, each bottle is individually hand numbered and signed. In short, it is one of the finest production issues of real Irish Whiskey available, pouring out of the bottle at 54% ABV without chill filtration. This fine dram has flavor and smoothness to spare. 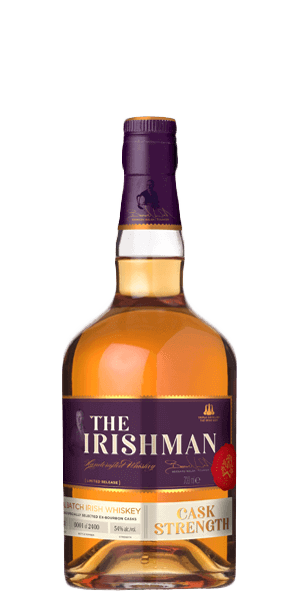 What does The Irishman Cask Strength taste like? The Flavor Spiral™ shows the most common flavors that you'll taste in The Irishman Cask Strength and gives you a chance to have a taste of it before actually tasting it. Vanilla and honey with toasted oat and a hint of caramel. Full bodied, with powerful oak and spice up front with a chocolate in the back palate with a hint of walnut. A lingering nuttiness and long trailing warm spice. An explosion of flavor, tasty finish, and exactly what you would expect from a cask strength. Very tasty, but you can also taste the high ABV.